The Hertzogin Cecillie was the last of the truly great clipper ships and when she was breaking up in Starehole Bay thousands came to mourn her passing. The ‘Duchess’ being built at Bremerhaven. We have three stories . One is about the wrecking of the ‘Duchess’ as she was known. One is the eyewitness account of a survivor, and one is about the man who was at the helm when the great ship struck the Hamstone. The south western coast of England has no lack of shipwrecks, and this second volume of The Wreckers Guide To South West Devon traces the history, fate and rediscovery by scuba divers of another collection of wrecks around Plymouth. 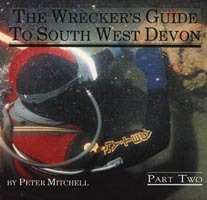 Packed full of rare archive photos and previously obscure information trawled from maritime history records, each wreck featured in The Wrecker’s Guide has been dived extensively by author Peter Mitchell, providing first hand insight into what remains and what these shipwrecks can still tell us of their past. The Wreckers Guide To South West Devon Part 2 contains complete histories, photos and wreck location marks for the following wrecks – those underlined appear on this site.